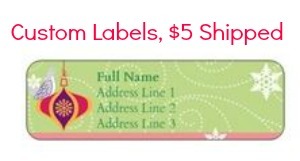 Vistaprint is offering (140) custom return address labels for $5 Shipped so make sure to get yours if you haven’t already! Today is the last day to get these cute personalized labels that are perfect for Christmas cards. If you don’t need address labels, they can make great gift tags too! We also use these with just a kids name on them to label school gear and baby things for the nursery at church. There are many templates to choose from, plus upload your favorite photos, create your own logo and more!